There a lot about this book that I love – there is so much to be jealous of. These girls found the time and dedication to travel for an entire year. It’s something I would love to do and it’s also something I know I will never do. It’s just not my life. So living vicariously was exactly why I picked up the book. These girls traveled to places I have never been and say such amazing things. I really loved reading about it. Still, I just can’t rave about the book. There’s nothing wrong with it, per se, it’s just a little bland. Vanilla. I can tell these girls are used to a very journalistic writing. Their prose all sounds exactly the same and, with names like Jennifer, Holly, and Amanda, I found it impossible to keep them straight. I was constantly mixing up who was who. I feel like the book would have really benefited if they could have figure out a way to develop different writing styles. Some visual aides could have really helped – you know they took a million pictures. I would have loved to have seen the beat-up van, Esther, the yoga retreat, etc. Despite the adventures and nice mixture of this-is-what-I-saw and this-is-what-I-felt, it took me a really long time to get through this book. This is something I should be devoured. Besides the lack of voice, I’m not sure what was missing – other people maybe? One of my favorite memoirs is Somebody’s Heart Is Burning: A Woman Wanderer in Africa because of the author’s incredible ability to observe others and bring them into the story. 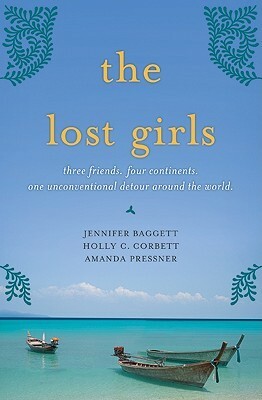 This memoir is firmly on these three girls and, despite being a young white woman traveler myself, I just couldn’t quite get invested. Still, it’s certainly not bad, and it’s a great thing to read if you’re itching for a trip of your own but can’t get away. There are nice tid-bits along the way, too, that give some good perspective. “After all my searching for something to believe in, what if taking the journey itself were the highest act of faith? Traveling anywhere that was foreign inevitably meant I’d have to rely on the kindness of strangers. To venture out in the world, I had to have faith in the goodness of people – and to be open to the lessons that every new person might bring. Amen, Holly. Or was that Amanda who wrote that? Jennifer? Oh, who cares. Amen, sister.